Violence has escalated in recent weeks in many places in both (north) Sudan and the newly independent Republic of South Sudan. This is especially true in Blue Nile and South Kordofan—border states that ended up in the North, but are home to large populations that fought with the southern Sudan People’s Liberation Army (SPLA) and identify with southerners—militarily, politically, and culturally. Many Sudan observers are being asked if renewed war can be avoided in this tortured country. Responses vary, but the simplest answer is that it can’t, because it has already begun. The bellicose rhetoric from the North’s leaders in Khartoum is more intense now than at any time since the separation of the North and the South on July 9. And it’s not just rhetoric. On November 3, Northern forces seized the city of Kurmuk in Blue Nile, which had been the bastion of those forces of the SPLA in the North that refused to disarm—the SPLA North (or SPLA-N), as they are known. (The SPLA-N’s reluctance to disarm within territories in the North is understandable: Given the ruthlessly vengeful and militarily unconstrained government in Khartoum unilateral disarming would be tantamount to suicide for people living in the North but identifying with the South.) Just after the seizure, Sudanese President and Field Marshal Omar Al Bashir declared that the northern regime was ready for war with the South and that it had lost all patience with “provocation” from Juba—the southern capital. Withdrawal by SPLA-N from Kurmuk prevented a civilian massacre, but the attack on the city sent tens of thousands of civilians fleeing into Ethiopia—adding to the hundreds of thousands of refugees displaced by military activities that began this summer, when the northern regime began an assault on the disputed border region of Abyei. Furthermore, the strategic military consequences of the North’s entry into Kurmuk are ominous. The Satellite Sentinel Project (SSP) has recently reported that the North’s forces immediately began to expand the airfield outside Kurmuk, which is only about 40 miles from the border with Upper Nile State in the South. Assaults by the North on southern territories soon accelerated. On November 8, in the remote Mabaan region of Upper Nile State, the North’s bombers killed and wounded more than a dozen people, according to humanitarian sources on the ground. 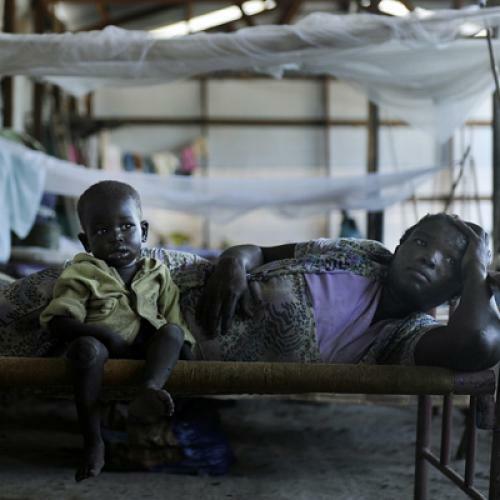 On November 10, the North bombed Yida refugee camp in the southern Unity State, home to some 23,000 civilians. One bomb, which did not detonate, landed next to a school where 200 children were present. The attack was confirmed by journalists from Reuters and the BBC, a humanitarian organization on the ground in Yida, and UN investigators, but the chief army spokesman for the North and, incredibly, Khartoum’s ambassador to the UN, denied that it took place. In addition to these direct attacks, Khartoum’s proxy war is accelerating in the South. In the past few months, renegade rebel forces—almost certainly funded and organized by the North—have been destabilizing the South by repeatedly attacking civilian targets, especially in Unity State and Jonglei. Analysis of evidence by the Small Arms Survey (produced in Geneva) makes clear that these rebel forces have been heavily armed with weapons of Chinese manufacture, which could only have come from Khartoum. (A November 16 statement issued by Chinese and Sudanese officials asserted an increasing and deepening military cooperation between Khartoum and Beijing.) These so-called “rebel groups” are nothing more than brutal mercenaries, deployed to create leverage if negotiations ever begin—or tie up southern military forces if war expands. Productive negotiations between the North and the South seem increasingly unlikely: Just before a key meeting was to begin in Addis Ababa last week under African Union auspices, the North balked and proposed deliberately preposterous and unacceptable terms for oil revenue sharing. (The South possesses most of the region’s oil reserves.) This is consistent with past behavior. A June 28 agreement to resolve the armed hostilities that took place over the summer in South Kordofan and Blue Nile was renounced by President Bashir three days later. A month later, the North invaded Blue Nile. And the world’s response to such behavior? There seems a perverse inability (or cynical unwillingness) to connect these conspicuous dots. The U.S. special envoy, Princeton Lyman, declares that we have no cards to play. All we can do is “promote negotiations,” Lyman declared in an interview with Darfur’s Radio Dabanga. For its part, the UN indulges in a predictable moral equivalence, urging both sides to exercise restraint. This facile exhortation does not acknowledge the restraint the South has already shown in the face of a year’s worth of cross-border bombing attacks. 1. Shut down all talk of debt relief for Khartoum. Given the highly distressed state of the northern economy, Khartoum is desperate for debt relief. Germany and France have both made gestures toward this. The U.S. should make it clear it will use all its political power to prevent debt relief for the North until it makes a just peace with the parties in Sudan and grants full humanitarian access to all populations affected by conflict. 2. Keep Sudan on the State Department list of terrorism-sponsoring nations. The U.S. should keep Sudan on this list until all aerial bombardments in Blue Nile, South Kordofan, and Darfur stop. (Removal from the list requires the State Department to certify that no acts of terrorism have been committed or supported by a regime on the list for the six prior months). 3. Make U.S. satellite reconnaissance showing Khartoum’s military actions against civilians public. Using its massive satellite resources, the U.S. should publicize the scale and nature of Khartoum’s military actions. Unlike the SSP, the U.S. intelligence community has no limit on the resolution (pixels per square centimeter) of its images or weather constraints on its surveillance capabilities. So far, however, the Obama administration has been inert in responding to or augmenting the critical findings of SSP. 4. Accelerate defensive arms deliveries to South Sudan, particularly anti-aircraft weaponry, as well as surveillance and communications equipment. 5. Use military force to deter the bombing of civilians. The U.S. should declare that for every military air attack on civilians or humanitarians, it will destroy (by cruise missile) an aircraft at the major northern air base in el-Obeid. What can’t be doubted is that if the U.S. and its allies do not quickly change the calculus guiding decisions being made in Khartoum—right now—expansion of war is inevitable.